Legal shows the the legal state of Power Manager. 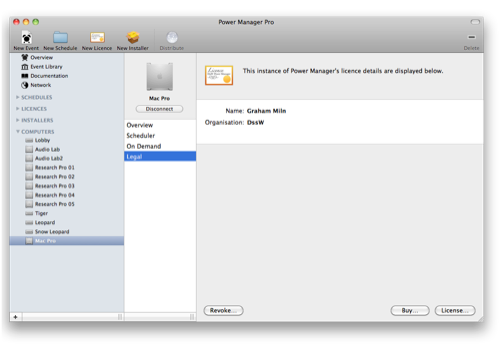 Each copy of Power Manager must be licensed in order to be used after the initial demonstration period. Legal provides the option to remotely enter your licence details, or revoke previously entered details. Avoid typing your licence details into each of your Macs by creating a Licence Groups. Professional includes the ability to create Licence Group to manage your licences. Licence Groups can be distributed quickly and easily to your Macs across the network. Click on, and connect to the Mac. Navigate to the Computer's Legal. Click on the License… button. Click on the Revoke… button.